You have obtained a first search result. You can now refine it by using the left column, either by typing a second keyword that will be added to the first, or by clicking on a label. You will get a second result that you can further refine. 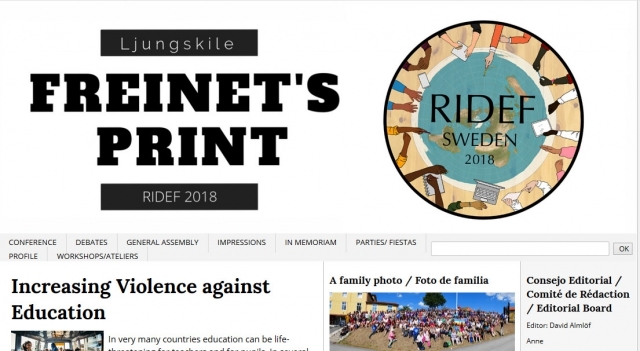 We kindly invite you to read the Official Newspaper for the 8Ljungskile RIDEF 2018, "Freinet's Print". Thank you to all, for my election at CA of Fimem. I want to thank first my Italian companeros, after my friend Nuccia Maldera. I also greet Eduard, that after a few years, leaves the CA. I am very honored, to have been elected in such an important organism as the CA of Fimem; the federation of our associations of educators who, as volunteers, dedicate part of their time and their energies, to a better world. I promise to do my best, to honor this position. Minutes of the meeting of the jury for the attribution of the first "Maestro Benaiges" scholarship. MANIFESTO 350 educators from 27 countries meet at the 32nd International Meeting of Educators Freinet (RIDEF) at Ljungskile in Sweden. During the last fifteen years, an "atomic bomb" has been deployed in the Mediterranean: 34,361 victims so far, including many children. The new Board of Directors BD of the FIMEM has only four members, which isn’t sufficient according to the statues and the work to be done. Choose now the long workshop that you want to follow! Important: we want to ask you to choose your long workshop now. So please make your choice today! Several workshop leaders would like to contact their participants before Ridef starts. Thank you. You can choose and read all information about the long workshops. Choose on this link. To see all the short workshops we have received so far: have a look here. We wish everyone good luck with preparation and visa procedures. Hope to see you soon in Ljungskile! How to get a visa for Sweden ? In certain countries, Sweden is represented by another Schengen country. If you intend to hand in your visa application at another Schengen country’s mission abroad, you should contact the mission in advance. In such cases, it is this country’s documentary requirements which will apply.CHECK! For the Swedish, Danish and Italian (?) embassies the documents should be translated to English. For the French and Belgian: French?